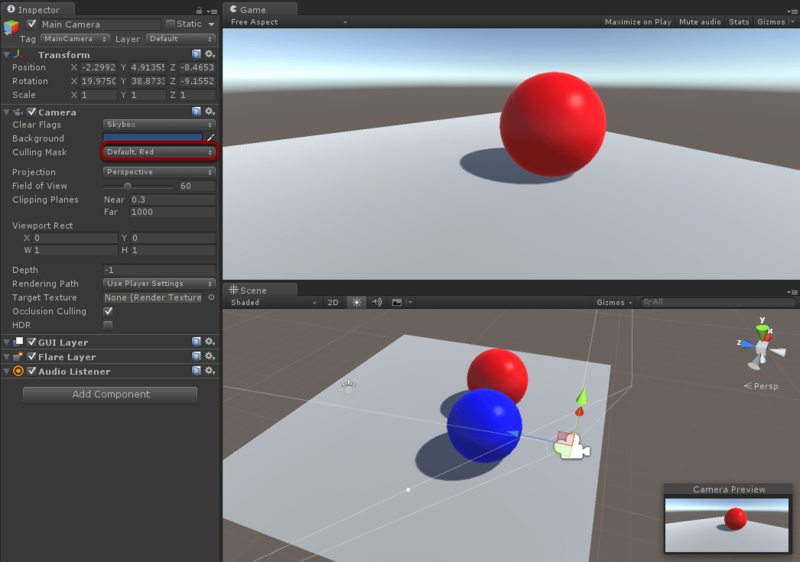 From what I observe, many Unity users do not grasp the concept of using multiple Unity cameras on a single scene. “If I want to look from only one perspective, why do I need more than one camera?”. Saying that it makes perfect sense when more than one camera captures the scene from the same perspective makes it even more confusing. So why even bother? The reason is somewhat complex, but it’s really worth learning. It will help you create great visual effects, that are hard to accomplish with the use of only one camera, in an easy way. What is the Unity camera? If you’re already experienced in that matter you might’ve noticed that I’m not speaking about matrices. Let’s just ignore math-related stuff for now. Culling Mask can be set to Everything, or you may set which of the layers should be seen. This is one thing what layers are for. This camera sees only the Default layer (ground) and the Red layer (red sphere). The conclusion is that different cameras can render different objects. This is important information even if you don’t know yet how to use it in practice. It also means that adding second camera will not re-draw your scene two times. Only objects visible to the second camera will be rendered. Knowing this having multiple cameras rendering different layers will result in similar efficiency as rendering all these layers using only one camera. Let’s then answer the main question: Camera is an instruction to render specific list of objects from given perspective. Wait, haven’t we just answered that question?! Well… not exactly. There’s a visible and an invisible part. What you can see is a result image (let’s call it color buffer). And of course there’s a thing that you cannot see. This thing is called a depth buffer (called also z-buffer). Before rendering anything into color buffer and depth buffer, camera can clear both buffers or only the depth buffer. Did you notice that the default Unity 5 scene camera clears buffers to Skybox? Don’t Clear doesn’t clear anything. What will happen if we will try to set the default camera Clear Flags to Don’t Clear? Well, the effect may be interesting (I moved the camera a little after entering the Play mode). It looks like our sphere duplicated itself so many times, that it turned into some kind of wired, rounded pipes thing. Besides that there’s still one red sphere on the scene (note that Blue layer is still not visible to the camera), the game scene image looks valid. There are no graphical artifacts of any kind. Yet we managed to create an effect of many duplicated objects with only one object. This happened because color buffer was not cleared between frames (colors rendered previously were transferred to the next frame), also the depth buffer. Depth buffer remembered that something has been rendered and it was keeping this information when Unity tried to render another frame. When sphere was about to be rendered behind already rendered sphere image, invisible pixels were discarded. The same thing applies when there are many objects on the scene rendering one after another. If you still don’t understand what just happened, please stop reading now and try doing it yourself! Make a new scene, add an object, set camera Clear Flags to Don’t Clear and move either your object or your camera. I assume that you don’t want this kind of effect in your game, so what’s the clearing good for? Let’s now try to create two cameras. There’s one new parameter: Depth. Depth defines the order of rendering of the cameras. Camera with lower depth will be rendered before the camera with a higher depth. Whoa, do you see that? Since depth buffer has been cleared, the red sphere doesn’t know that its pixels are obstructed, so it’s rendering like there’s nothing on the scene. 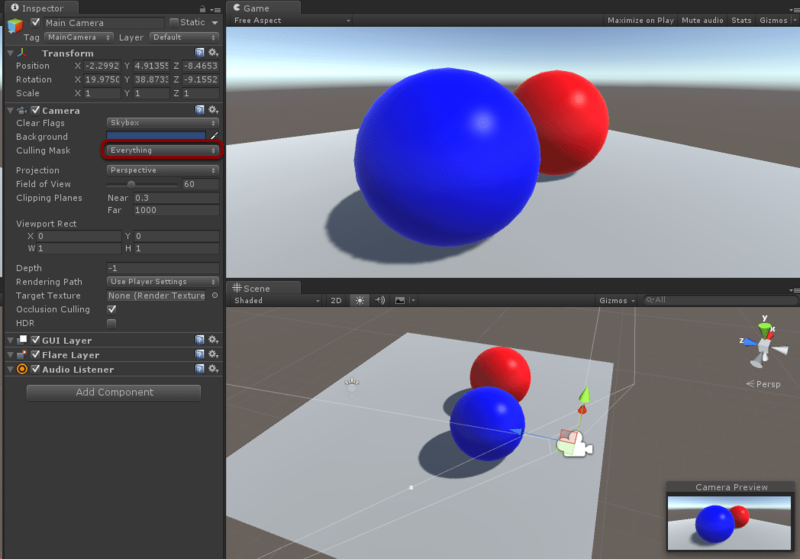 That means that clearing the depth buffer brings rendered objects to the front. This may be super-useful when you’d like to render 3D UI elements. In Skyrim you can see inventory items as 3D objects. These are rendered correctly even if background object appears closer to the camera. Let’s now switch Red Camera Clear Flags back to Don’t Clear and apply a different effect to the Blue Camera: Grayscale. BG Camera (depth -1) – contains only background scrolling art elements tied to player speed. Main Camera (depth 0) – contains the actual gameplay. Foreground camera (depth 1) – contains only foreground scrolling art elements tied to player speed. This way, I dont have to have a bunch of objects as children of the main camera and moving along with it. The background and foreground art can just scroll and be conmposited in using the Main Camera later. Is this an efficient method? I like it because it keeps things elegant and clean, but I am worried if this is having a big impact on performance for mobile. I believe that your approach is valid and efficient 🙂 If your cameras are not rendering your layers more than once you don’t have to worry about the performance. Just have in mind what a camera is. Camera is a “clear” command (optional) and a change of projection matrix. Adding camera effects to the blue camera doesn’t seem to do anything. Is this a feature that was removed? Ok, so it works in forward rendering path but not deferred. Is it at all possible to do this with deferred?